I originally found "Not Martha" because of a link to bacon cups. Now there's nothing particularly quirky about them. You can check out the directions yourself (with step-by-step photos, might I add) and although delicious-looking and fun, I didn't think they deserved a whole post to themselves here. The rest of the site is pretty cool, though, too. Check out the "how to make stuff" section for how to make tiny pies in mini-muffin tins, hostess snack cake sushi, pies baked in tiny jars....and a whole bunch of non-food stuff, too! 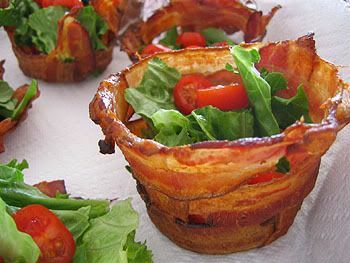 And the blog in general has a much more diverse selection of topics than I would've guessed from mere bacon cups! That looks yummy!! Although yu0o wouldn't want to out soup in it! Oh my... bacon is soooooo yummy. I might have to check those out. My husband wants to know if he can drink beer out of them. Lol! Well I guess maybe he could!